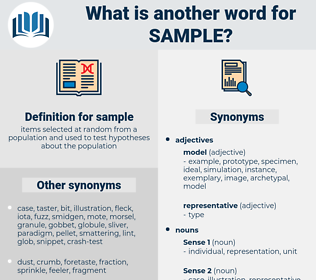 What is another word for sample? turn your hand to something. snapshots, references, interviewees, experiences, data, Categories, referees, Stories. 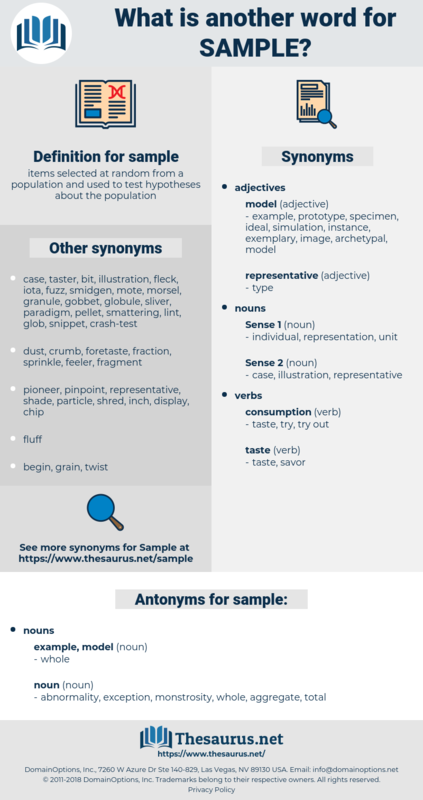 cross-section, specimen, sampler, exemplar, swab, prototype. aggregate, exception, monstrosity, abnormality, total. The following is a fair sample of such data. Wish you might drop in to sample my fare! semivowel, snowball, synovial, shamefully, snuffly, snaffle, sniffle, snowfall, snowmobile, snivel, symbol, snuffle, simple, shamble, swine flu, symphyla, Skinful, sinful, simple eye, seasonably, sun valley, sniffly, seasonable, shameful, snowbell, swamp willow, schnabel, San Pablo, snowplow, simply, scumble, swamp lily, snap willow. grab sample, random sample, tasting, coupon, cross section. have, ingest, take, consume, take in.